This mixture contains single and semi double flowers on dwarf compact plants. Colors range from delicate pastels to brilliant reds and yellows. 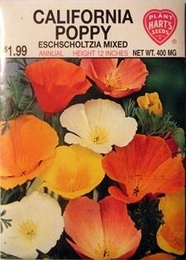 They make excellent bedding plants or cut flowers when picked before the buds open. Easily grown in any soil and blooms profusely for a long periods. Blue Ageratum makes an excellent border for a bed of California Poppies. Thinning - when plants are 2-3 inches tall thin to 6 inches apart.